← How do we get nearer to God through the Book of Mormon? The name “Christ” means the anointed one” in Greek or Messiah in Hebrew. To believe that Jesus is the Christ is to believe that He is the one chosen and anointed by Father to be the author of our salvation. He is the “firstborn of the Father, the Only Begotten Son in the flesh, and the Redeemer of the world.” (The Living Christ)2. It is to believe that he is the source of eternal life and that salvation comes only in and through faith on his name and obedience to the principles of his gospel. 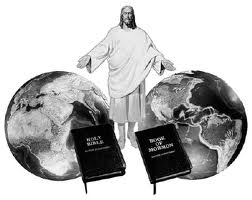 The Bible and the Book of Mormon are united in their cause to bear witness of Christ. Certainly we limit God when we say that the Bible is the only witness of Him and that there can be no more revelation. How can we as mere mortals presume to know all of the ways in which God communicates to his children? Jeremiah and Paul both describe God as the “true and living God.” Prophets in the Book of Mormon also use the term “true and living God.” A “living God” means a God who is actively involved in the lives of his children. He communicates with them. He’s not silent and distant. The Bible and the Book of Mormon bear witness of each other. The Bible and the Book of Mormon bear witness of each other. God, in his mercy, provides more than one witness of the divinity of Jesus Christ, that he is the Savior of the world and he is the only way to salvation. At one point Nephi sees a great vision of the life of the Savior and the latter days. In this vision he is taught by an angel. When the angel says, “the record of thy seed,” he is referring to the descendants of Nephi. The angel states, “These last records, (the Book of Mormon) which thou hast seen among the Gentiles, shall establish the truth of the first, which are of the twelve apostles of the Lamb (the Bible) . . . and shall make known to all kindreds, tongues, and people, that the Lamb of God is the Son of the Eternal Father, and the Savior of the world; and that all men must come unto him, or they cannot be saved. And they must come according to the words which shall be established by the mouth of the Lamb; and the words of the Lamb shall be made known in the records of thy seed (the Book of Mormon) as well as in the records of the twelve apostles of the Lamb; wherefore they both shall be established in bone; for there is one God and one Shepherd over all the earth. (1 Nephi 13:40-41) If God is “the same yesterday, today and forever,” and if he is “from all eternity to all eternity,” then so is his gospel. Truly there is “one God and one Shepherd over all the earth,” and that God is Jesus Christ. 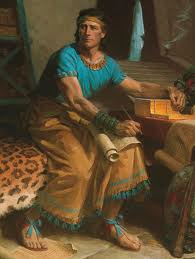 The writers of the Book of Mormon knew of their divine commission to bear record of Jesus Christ. It is clear that each Book of Mormon writer knew of his divine commission in writing. it was to bear witness that Jesus is the Christ, the Son of God. It is not couched in symbolism that only those “who have ears to hear may understand.” From its very beginning the Book of Mormon uses clear and unmistakable language in bearing witness that Jesus is the Christ, the Son of the Living God. In the very first chapter Lehi sees a vision of the Savior described as “One descending out of the midst of heaven, and he beheld that his luster was above that of the sun at noon day.” He gives Lehi a book to read. Lehi testifies to the Jews that the book “manifested plainly of the coming of a Messiah and the redemption of the world.” Lehi’s vision sets the tone for the rest of the Book of Mormon as a testimony of Jesus, the Son of God, and that he was the promised Messiah. There is probably no other book written that is so true to its purpose than the Book of Mormon. It not only teaches that Jesus is the Christ, it teaches us how to come unto Christ and be saved. It teaches us that he is the only way to salvation. It teaches the doctrine of Christ. It teaches us of the “straight and narrow” way to eternal life. It teaches us that Jesus “inviteth all to come unto him and partake of his goodness; and he denieth none that come unto him, black and white, bond and free, male and female; and he remembereth the heathen; and all are alike unto God, both Jew and Gentile.” (2 Nephi 16:33). Nephi pleads with us “hearken unto these words and believe in Christ; and if ye believe not in these words believe in Christ. And if ye shall believe in Christ ye will believe in these words, for they are the words of Christ, and he hath given them unto me; and they teach all men that they should do good. (2 Nephi 33:10) One cannot read those words without feeling of the love, passion and purity of intent of the Book of Mormon writers. 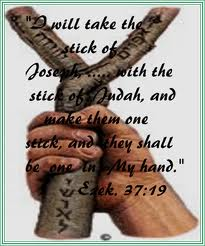 This entry was posted in Jesus is the Christe and tagged Bible, Book of Mormon, Christ, Christianity, Ezekiel, Jesus Christ, Joseph Smith, Mormon church, Nephi, scriptures, witness of Christ. Bookmark the permalink.